Located in Northern Ontario, in the Michipicoten township, Wawa is a fascinating town which many nature lovers flock to in order to capture its majestic beauty with their own eyes. Wawa is especially known for its great fishing adventures in the surrounding lakes and rivers which make Wawa so picturesque. In addition to the excellent, year round fishing, tourists can visit a slew of places in and around Wawa. 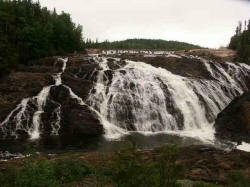 Such places include the Sandy Beach, the Scenic High Falls, the Agawa Rock Pictographs, the Lake Superior Provincial Park, Lake Superior and Wawa’s most unique feature in town, the Wawa Goose. 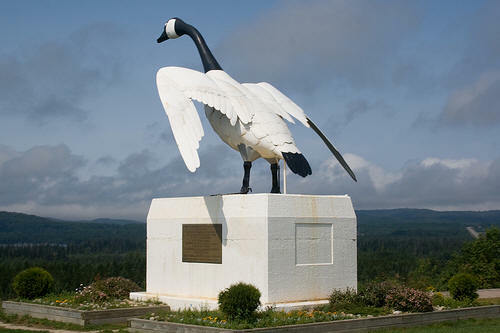 The Wawa Goose is 28 foot statue made of steel which was built in 1963. It is located near the Tourist Information Center. The town has appropriately kept its name, originating from the indigenous Ojibwe word “wewe” which translates to wild goose. This pristine area is home to some of the best fly in fishing in Canada. From the end of August until the end of September, Wawa is great place to catch Walleye fish in the deeper waters of Wawa lakes. You may be able to find Walleyes in the shallow waters during the early Walleye fishing season during the summer. If you are more of a Northern Pike fisher, then you can fish the Wawa lakes from summer until the end of Fall. 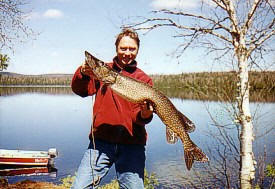 The northern pike also can be found in shallow waters until they transition into deeper waters later on in the summer. If summer vacation is coming early this year for you then you may want to go out on the Wawa waters in May and in June while the water is cooler and the trout are swimming about. These bountiful fish normally swim along the shoreline edges in the shallow waters of the Wawa waters. Wawa has many wonderful fishing spots all year long. Some of the best lakes to go fishing in include the Whitefish Lake and the Hidden Lake. At the later, fishermen will be able to find Northern Pike, Brook Trout, Whitefish, Walleyes, Lake Trout and smallmouth bass. In the northern section of Wawa lies the Missinaibi Provincial Park which is known for its large fish and attracts thousands of fishers per year. In the water bodies of this park, you will be able to find Walleyes, Whitefish, Perch and Northern Pike among other species. You can visit Dog lake where you will have your opportunity to fish for Jumbo Perch, Northern Pike, Walleyes and Lake Trout. If you are interested in trophy fishing, the Big Pine Lake is an exclusive trophy lake with Brook Trout, Lake Trout, Northern Pike, Walleye and Smallmouth Bass. You can also find these species in non trophy lakes including the Ivanhoe Lake, the Windermere Lake and the Kabenung Lake, all located in Wawa, Ontario. Wawa also holds great Ice fishing tournaments and derbies. These tournaments take place during the winter months and particularly in the last week of February or the first week in March. These tournaments base prizes on the largest Whitefish and Lake Trout that are caught. Spaces are limited in such ice fishing competitions so you should make your entry as soon as possible so that you can guarantee your space and find a reservation in one of the many fine Wawa accommodations that are available to fishermen. From a large steel statue of a goose to dozens of beautiful, clear water lakes, Wawa is certainly the perfect place to go fishing. You will be able to fish all year around on the Wawa waters and view the rest of the cultural and natural wonders that Wawa has to offer its visitors.